Mandy Fish: Come Mr. Talisman, Talisman Banana. I have been self-diagnosed with OCD-lite for many years now, but only recently diagnosed with real, doctor-approved OCD. Which cracks me up because I've made of joke of having fake OCD for so long now and here it turns out I've had actual, real-live OCD all along. Maybe it's a form of denial? As if to say, "I will joke about this because if I were serious about it I would be scared. Haha." Despite the fact that it's official now, I still view my OCD as "lite." I don't need medication for it (well, aside from Xanax, but that doesn't count, right?) and it doesn't really disrupt my life to such an extent that I don't leave my house or have successful interpersonal relationships. Okay, the latter is debatable. But whatever. It's not like I'm Melvin Udall from As Good As It Gets. I mean, sure, I can't just go to bed when I'm tired. I need to do the rounds. Turn on the dishwasher. Straighten the hand towels. Wipe the counters with Windex®. Straighten the pillows on the couches. Fold the throw blankets. 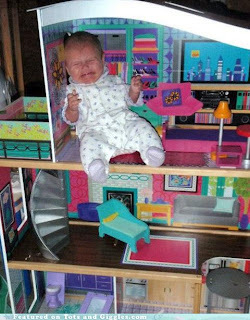 Make sure the dollhouse furniture is placed in the right rooms, according to my own sense of feng shui, and the correct dolls are in their proper beds. Clean my ears with Q-tips every time I pass the hall closet. Line up the Buddhas. The perfume bottles. The shoes. You know, the usual. That baby is not feng shui. Every time I drink out of a can, I have to tap the top five times before I open it. I always thought this was a child of the 70s thing. My sister taught me to do this when I was a kid and I've never stopped. She said it would prevent the carbonated beverage from exploding. I say "carbonated beverage" because I don't want those of you who aren't from Michigan to make fun of me. We call it "pop." There's pop and diet pop. What do the rest of you call it? Soda pop? Soda pop sounds old-fashioned to me. And kind of backwoods. I suspect ya'll say, "Sody pop" and for that, I am mocking you in my head. I do a lot of weird stuff in my head. Certain phrases and words can get caught in my brain and I repeat them over and over to myself. Like the Banana Boat Song. I used to think, "Come Mr. Tally Man, tally me banana," as a kid over and over again, whenever I would get nervous. If I hear the song even now, as an adult, I will be thinking it for days afterwards. Recently, I read an article online where the author used the phrase, "The bomb.com." Remember when people used to say that? "Wow, I think that's the bomb dot com!" Well, it cracked me up. And then I proceeded to say it over and over in my head for a couple of weeks. "The bomb dot com. The bomb dot com. The bomb dot com." It was soothing. I would relax when I thought it. I didn't say it out loud or anything, or mumble it. I'm not crazy, okay? But if I were driving in my car, or sitting at my desk, or trying to survive a boring meeting, I would just think "The bomb dot com" and I was instantly happier. Life was better. I guess that's sort of like an ear worm. An ear worm is when you hear a song and you can't get it out of your head. Only my ear worms aren't songs. They are phrases or words that I repeat over and over in my head for days. I like to think it's sort of meditative. It calms me. I have other little talismans that soothe me throughout the day. If anyone does anything to upset me, or if I get criticism that I don't like, I immediately go to the blog Suri's Burn Book. If I have an unpleasant thought that I can't get out of my head, I click on Suri's Burn Book and just look at a few entries and everything is all better. A fight with someone? Suri's Burn Book. Stress? Suri's Burn Book. Doubt? Suri's Burn Book. I just sort of compulsively click on that bookmarked page and just looking at an entry, even if I've read it before, it instantly calms me. OMG. Is Suri's Burn Book my The Catcher in the Rye? For those of you who don't know the reference, Mel Gibson's character in Conspiracy Theory was obsessed with J.D. Salinger's book. He would buy a copy of it every time he was upset or something bad happened. For me, Suri's Burn Book is simple. Straightforward. Nothing but happiness and joy happens on Suri's Burn Book. It's just a picture of a celebrity or a celebrity's child, with Suri Cruise's imaginary snarky fashion criticism. Suri, I know, baby. She shouldn't be wearing flouncy skirts. It's like the Windex® of blogs. Simple. Clean, Efficient. 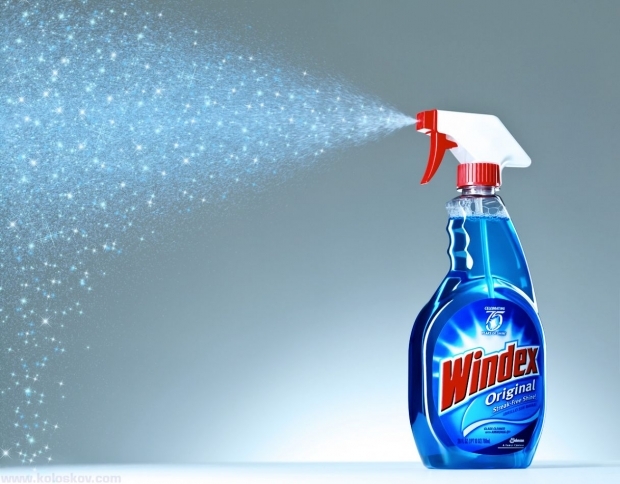 If I'm stressed out at home, I can just spritz Windex® all over the counters and erase any imperfections and dirtiness. I can spritz the floors in Windex® too and everything looks better. Smells better. Shines. The world is just a little bit better. A little calmer. More organized. In control. And everything is Okay. Basically, it's the bomb dot com. I do the same thing with phrases and songs. Any time I feel a little anxious I will blurt something out in my head....a way of pushing the negative thought out of my mind. I'm just glad we haven't started saying these things out loud. I'm taking over your blog here but these are my PEOPLE. I too used to call it 'pop' and I am from Washington State. I have kinda dropped it after several geography jumps later, but I still prefer that term. It's cute. Pop. It is cute. Pop. There I said it. Now I need to find a can to tap. Anyhoo. I am a can-tapper as well, simply cannot NOT tap the can. And I say just "soda." Also aren't serial killers supposed to be big fans of Catcher in the Rye? I like having the helpful disorders. So convenient. Except when they're not. All these things I do and didn't know they were something. I'm a can tapper. I also want Mandy's kind of OCD. I have the opposite kind, the kind that just slows me down . We called it pop growing up, but I switched to soda in college--way more cool. I wonder what happened to my OcD. I had repetetive words, phrases and songs in my head as a kid and young adult. They annoyed me. I would do things to block them, like humming or shaking my head or telling myself to stop. But they have been gone for years and I missed them going. I wonder where they are. Haha. That's OK. I have ADHD. I wish I found out when I was younger. It would have made my life way easier. And I am now planting the Pina Colada song in your head and instructing you to hear it for at least five days. Is the Pina Colada song the one about the want ad? "Do you like pina coladas, and getting caught in the rain?" I think, perhaps, maybe, possibly, you may want to upgrade to OCD-Medium. Just a thought. To think, over and over. And over. You may have a point. Would that be OCD Grande? Or OCD Venti? "OCD Grande? Or OCD Venti?" I can't believe you coined snort.com before I did. My 20-something assistant has been introducing me to a whole new generation of lingo. She used awesome dot com in a meeting the other day and since then, I've been just waiting for some opportunity to use "[insert random adjective] dot com" in a sentence to another person outside my head. I'm totally OCD-Venti with soy, no whip, but with cinnamon sprinkles. My house and car thermostat cannot be set at a temperature ending in 1, 3 or 6. 9s and 4s are not great, but will do in a pinch. 2, 5 and 7 are best. I kinda love your assistant. I have to admit to saying, "You look totally gorge." I do the same thing with phrases that get stuck in my head. But it's usually only for a couple of hours. Sometimes, they're just sticky. Sometimes they are. "They're just sticky" could become one of such phrases that stick. You kill me. "I've been diagnosed with success." You should be a motivational speaker. Yeah. My son has to hit a light switch three times. He has to. I let him. Thanks for this inside peek, because I love the shiny and I wonder? I have to do the refrigerator handle. I can't concentrate if the refrigerator handle isn't shiny. And did you know this? That if you try on swim suits,they advise taking WIndex along to spray on the crotch b/c it kills crabs and germs? See? 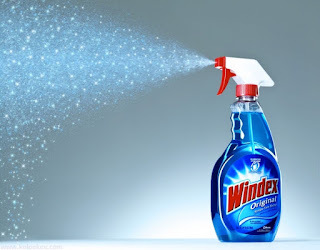 Windex can do anything! Oh, so many reasons I love this post. (I might have to have a for-reals conversation with you about OCD, though. My eldest niece has taken to pulling out her lower eyelashes when she gets stressed and my sister is taking her to see someone to discuss OCD. I wonder if you have any advice.) I think I have a mild case, but mine comes in the form of obsessively needing to keep my nails nice and applying hand lotion too often. I also organize when I feel overwhelmed or when Mr. W leaves. I wish we could barter obsessions, though. My house could for sure use more Windex applications. I don't really have any advice but it would be good if your sister took your niece to someone who specializes in OCD. I honestly don't find mine that problematic in my life, but then again, I am the Queen of Denial. I would be more than happy to Windex your house for you if you will file my paperwork. I'm not OCD, but I used to have a lot of superstitions tied to sports. Like in baseball, I had to crack my knuckles on the bat handle with each hand. Then I had to take exactly four practice swings in the on-deck circle. Then I had to take exactly one practice swing while in the batters box. When I pitched, I had to touch the bill of my cap before every stinking pitch. In football, I had to have one side of my jersey untucked. In basketball, I couldn't end the warm-up before games until I made three shots in a row. I'm so glad those days are over. Although i still play pick-up basketball and I still have to make three in a row before I play. Grass? Grass tickles my feet. Incidentally, around here its not soda or pop. It's Coke. It's all Coke. Except with a little c, as in coke. Gimme a coke. And they ask "is Pepsi OK?" and most people say "yeah, I guess." Otherwise, we say specifically which one we want - 7Up or Sprite or whatever. But Coke is the default. Or coke. But never pop or soda or even soda pop. My dad used to ask for "soda water" and when my sister worked at Burger King she got so irritated with that she actually filled a cup with soda and water and gave it to him. He didn't like it, but he kept ordering "soda water" anyway. Two more stubborn people you'll never meet than my father and my sister. So anyway, I really liked this post. To be fair, I tend to like everything you post. I'm just not around as often as I'd like because I have so little free time these days. Maybe if I were a little more OCD I'd get more done and have more time for blogging? Probably so. It's the bomb dot com. Obviously. I missed this one. Goddammit. Stupid twitter. *whines* I am trying to get back into this whole social media and I feel I am always behind. This was hilarious. *arranges doll house furniture* Laugh! I was thinking of you the other day as I examined the contents of my fridge (old bottles of salad dressing, sometimes three and four of the same flavor just sitting there with barely a tablespoon left in it) and thought, "Mandy wouldnt have a fridge arrangement like this. If she were to ever visit me would this drive her insane?" You're so much like my mom. I only wish some of that would have rubbed off on me. I'm a slob compared to you crazies. Will have to check out that site. Looks funny. Did you see that Gilmore's site was on Watch It Live? I've known someone for an extended period of time, but only recently had to spend much time around her. 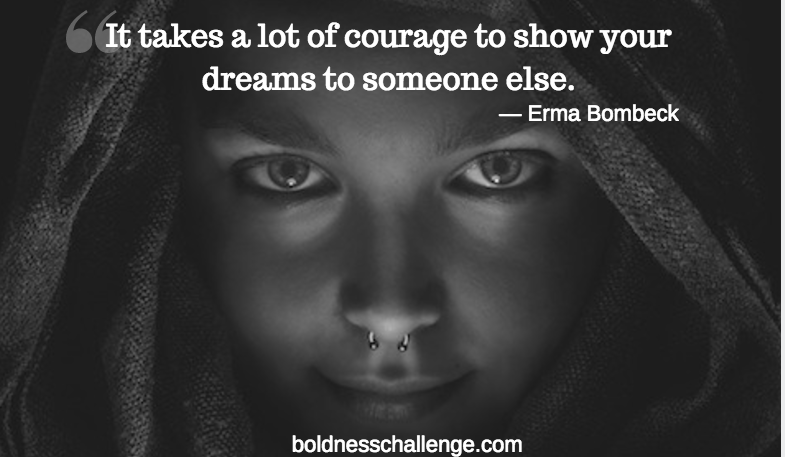 Once that began, I noticed some behavior patterns which struck me odd, but which I did not notice when we were only around one another for holidays and brief visits. About 3 or 4 months ago, it finally hit me, OCD. Thanks for chatting this subject up in a light-hearted manner. We call it pop in England.